Nothing makes a bathroom or kitchen look old and dirty faster than grubby grout and tired old tiles. These also tend to harbor mold and mildew, which pose serious health risks. Here’s all you need to know to give these smooth surfaces a new lease of life – the natural way. Kitchens and bathrooms are hot and steamy rooms – which gives mold and mildew the perfect opportunity to thrive. And the porous and uneven surface of grout is the ideal place for this fungal growth to set up shop. By reducing the moisture levels in these rooms you’ll reduce the growth of mold in grout and on your tiled surfaces. A quick wipe down of tiles after showering or cooking may be all you need to do to keep the worst of the mold growth at bay. You could also open windows, or switch on an exhaust fan or dehumidifier. Soap scum, which can build up from using conventional cleaners and personal care products, helps mold and mildew to adhere to these surfaces, and allows them to multiply quickly. A regular application of natural products will go a long way toward cutting through this residue. As one of the most commonly used cleaners, chlorine bleach is usually the first line of defense against the mold and mildew that pops up on grout and tiles. It’s also incredibly effective at removing the buildup of soap residue. However, bleach has some adverse effects that go way beyond discoloring clothing! As printed on the label, simply inhaling the fumes from this corrosive liquid can be irritating to the eyes, skin and respiratory tract. In fact, a 2015 study published in Occupational and Environmental Medicine suggests that passive exposure to bleach in the home is linked to a greater risk of children developing respiratory illness and infection. The children who lived in bleach-using households were found to have a 20% higher risk of flu, and a 35% higher risk of recurrent tonsillitis. What’s more, bleach is toxic to waterways and aquatic life – it comes from the organochlorine family of chemicals which are rarely found in nature and which take centuries to decompose. To effectively clean tiles and grout (with or without bleach) it’s important to note that a hands-on approach is needed. While bleach can color mold white so you no longer see it, a strenuous scrubbing is necessary to get the cleaning products into the tiny pores of the grout, killing the root of the mildew and removing soap residue. An old toothbrush is the ideal tool for this, while tiles should be thoroughly wiped with a washcloth or sponge. Now that you know how damaging bleach is, and that it requires the same amount of scrubbing effort as other products, why not check out some greener alternatives? Here are a few of the natural products you can pair with elbow grease to get sparkling tiles and clear grout. For regular light cleaning of water spots, minimal product residue and dust, the gently abrasive action of baking soda may be all you need. Dip a damp sponge into a bowl of pure baking soda and use this to scrub down tiles, grout and other bathroom and kitchen surfaces. Rinse thoroughly or wipe well with warm water. Among natural cleaners, vinegar is one of the most versatile and effective. Its acidic nature means it creates an environment that inhibits the growth of mold, mildew and some bacteria. It’s also fantastic for cutting through soap scum, mineral deposits, water spots and more. Mix equal parts distilled white vinegar and water in a bottle and spray it generously onto tiled surfaces. Allow to sit for a few minutes before scrubbing with a brush or sponge. Extra tough stains may require the combined action of baking soda and vinegar. Vinegar also works as a daily preventative agent so be sure to spray this mixture on tiles and glass surfaces before you get out of the shower. Salt kills single-cell organisms, like mold, by dehydrating them. Surprisingly, in order for this to work, the area around the mold must be kept wet while the salt is applied! For floor tiles or other flat surfaces, you can rub the area with a damp cloth and sprinkle on salt, before scrubbing into the grouted parts. Allow to work overnight before cleaning off in the morning. Any type of coarse salts, including Epsom salts, will work. Lemon juice is a favorite among natural beauty enthusiasts for its ability to lighten stains and skin blemishes. It has the exact same action when it comes to tiles – it is an effective stain remover. Like vinegar, fresh lemon juice is acidic in nature and creates an inhospitable environment for mold and mildew. It works best when combined with baking soda. This naturally-occurring mineral is a product of the seasonal evaporation of salt lakes. It is highly alkaline (with a pH of 9.3), which is why borax is so effective at cleaning, disinfecting and deodorizing. Use borax in the same manner as you would baking soda: dip a damp sponge into a bowl of borax powder (such as this one from Pure Organic) and scrub until your tiles and grout shine. When all else fails to whiten grout and remove stubborn molds, it’s time to get out the hydrogen peroxide. Typically used for sanitizing cuts, hydrogen peroxide is a fantastic fungicide and whitening agent. Mix hydrogen peroxide with white flour to create a thick paste. Apply this to the grout and tiles and cover with plastic wrap. Allow to work its magic overnight, before rinsing well with cold water. An incredibly effective method of removing dirt, soap residue, bacteria and mold, steam cleaners rely on high heats and pressure to do their job. These machines require no chemicals or products at all – and can be a great option for those who have chemical and mold allergies. While steam cleaning is great for grout lines and tiles, it is not appropriate for silicone joints, or anodized or enamel surfaces. 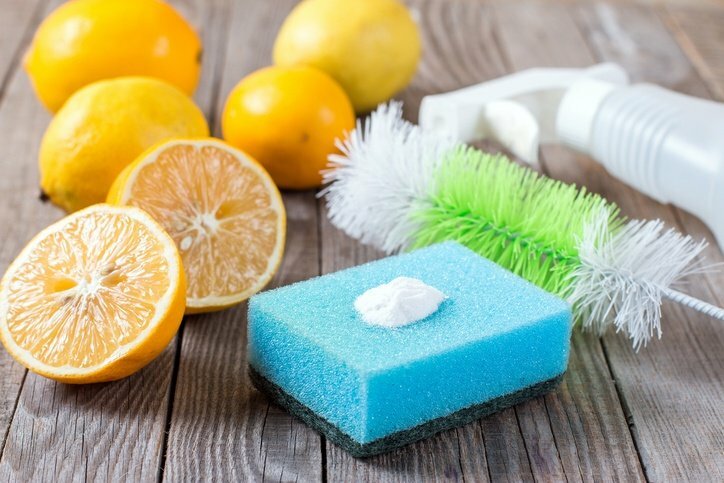 These homemade cleaners use multiple natural products to ensure your tiles and grout stay sparkling and germ-free. They can all be made ahead in batches for fuss-free cleaning. Homemade Bathroom Cleaner – used for tubs, tile, grout and all other bathroom surfaces, this cleaner is made with baking soda, hydrogen peroxide and a dash of liquid dish soap. Grout Cleaner for Tough Stains – stubborn dirt and mildew can be easily scrubbed away with this mix of baking soda, washing soda, borax and liquid castile soap, especially if you pre-wipe the area with full strength white vinegar. Citrus Scented Grout and Tile Cleaner – deodorize your bathroom and clean it all in one. This cleansing scrub consists of baking soda, lemon essential oil and vinegar. Whitening Scouring Powder – an effective and refreshing mixture of baking soda, cream of tartar, borax, and grated citrus peel.